National Trust Nostell01924 863892work Historic HouseNostell is an 18th-century architectural masterpiece with a landscape park and gardens. The greatest architects of the time designed the decorative rooms, which are filled with priceless artworks and collections including over 100 pieces of furniture designed by Thomas Chippendale. Nostell looks after one of the first longcase clocks made by the famous inventor, John Harrison. Home to a rich variety of wildlife, the surrounding 300 acre estate is a colourful tapestry of woodland, lakes, meadows, a working kitchen garden and the secluded Menagerie Garden. Bring your bike for a spin on the brand new woodland trails, designed with families in mind, and join in regular running, walking and cycling groups and activities throughout the year. 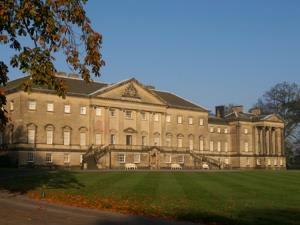 Nostell is an 18th-century architectural masterpiece with a landscape park and gardens. With the popular adventure playground, house and nature trails available throughout the year and a packed programme of activities every school holiday, Nostell is a firm family favourite. For grown-ups, there's a varied range of events too including creative craft workshops and Nostell Nights; a chance for adults to explore the house after hours with the help of artists, musicians and makers. The House is open on Bank Holiday Mondays.